From Robert Leckie, the World War II veteran and New York Times bestselling author of Helmet for My Pillow, whose experiences were featured in the HBO miniseries The Pacific, comes this vivid narrative of the astonishing six-month campaign for Guadalcanal. Unfortunately, due to sales rights restrictions, we cannot offer Challenge for the Pacific for sale in your country. From the Japanese soldiers' carefully calculated-and ultimately foiled-attempt to build a series of impregnable island forts on the ground to the tireless efforts of the Americans who struggled against a tenacious adversary and the temperature and terrain of the island itself, Robert Leckie captures the loneliness, the agony, and the heat of twentyfour- hour-a-day fighting on Guadalcanal. Combatants from both sides are brought to life: General Archer Vandegrift, who first assembled an amphibious strike force; Isoroku Yamamoto, the naval general whose innovative strategy was tested; the island-born Allied scout Jacob Vouza, who survived hideous torture to uncover the enemy's plans; and Saburo Sakai, the ace flier who shot down American planes with astonishing ease. Propelling the Allies to eventual victory, Guadalcanal was truly the turning point of the war. 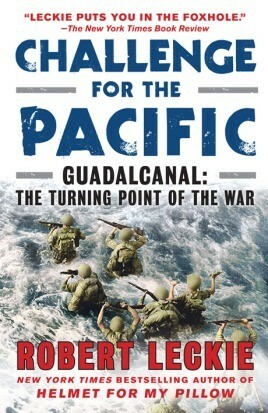 Challenge for the Pacific is an unparalleled, authoritative account of this great fight that forever changed our world.